From the New York Times comes a highly relevant reflection on something that bedevils most people in the modern world: the constant bombardment of distractions and stimuli that make it harder and harder for us to focus on any one thing. Attention is a resource; a person has only so much of it. And yet we’ve auctioned off more and more of our public space to private commercial interests, with their constant demands on us to look at the products on display or simply absorb some bit of corporate messaging. Bayanihan is a concept in the Philippines that refers to a spirit of communal unity and cooperation, usually centered on members coming together to help one of their own. It has its origins in rural towns, where members help a family move to a new place by volunteering to physically transport the entire house to a specific location. This is usually followed by a celebration to express gratitude to the volunteers. Bayanihan practiced in its original form. Courtesy of Wikimedia. Bayanihan persists to this day in both rural and urban communities, especially in slums. Examples include raising money to help one member pay for medical treatment, helping new arrivals get situated, and rebuilding any homes lost to natural disaster. Even the poorest citizens manage to pool their resources and capital together to ensure one of their own is looked after. In its most dramatic manifestation, bayanihan was utilized in the capital city of Manila to form a successful grassroots movement, which influenced the government to help establish better housing and infrastructure for poorer residents. 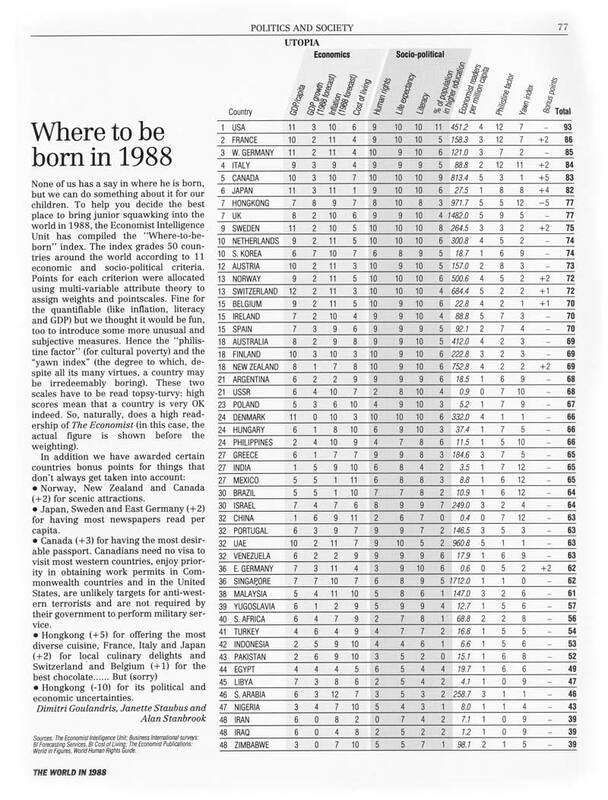 In 1988, The Economist compiled a ranking of 50 countries according to which would be the best place to be born (or put another way, which would be the best to settle and start a family). This was determined on the basis of 11 weighted sociopolitical and economic criteria, ranging from the quantifiable (such as GDP growth) to the subjective (cultural richness). The results can be seen below. The United States tops the list, followed by France, West Germany, Italy, Canada, and Japan. The Soviet Union managed a respectable 21st place, with communist Poland and Hungary not that far behind. The Philippines, India, and Mexico also ranked relatively higher than one would expect from developing countries. Saudi Arabia, Nigeria, Iran, Iraq, and Zimbabwe rank the lowest. 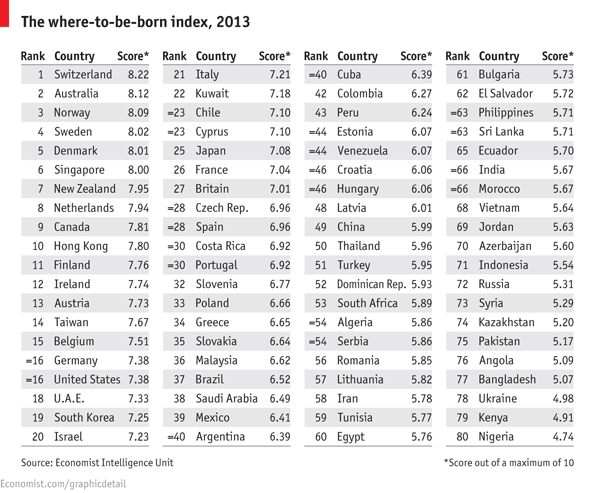 Anyway, in 2013, The Economist revisited this “where-to-be-born” index, which basically measures overall quality-of-life both presently and in the foreseeable future. As before, there are 11 indicators involved, including the results of life-satisfaction surveys, public trust, crime, and even geography (environment and natural beauty can go a long way towards leisure and comfort). The United States is now in 16th place along with former third-place winner Germany; France falls to 26, Italy to 21, Japan to 25, and Canada to a still-respectable 9. In their place are mostly small, northern European countries, as well as Australia, Singapore, and New Zealand. Notice how Saudi Arabia and Iran have improved, while poor Nigeria remains among the bottom five (indeed, it is dead last, although Iraq and Zimbabwe, whose fortunes have each only gotten worse over the years were not measured this time). Granted, a direct comparison between these two charts can’t say much, since The Economist measured far more countries, and claims to have been much more rigorous in its metrics, the second time around. Moreover, the inclusion of several subjective factors leaves much in dispute; for example, even people in otherwise prosperous places (e.g. the French) often report a low rate of life satisfaction regardless. Needless to say, individuals will weigh certain factors differently depending on their personal or cultural preference: environment may not matter as much to some as, say, public trust, and visa versa. Of course, any effort to determine where is the best place to live or start of family is going to be arguable. It touches on a macro version of what makes for a good life. Clearly, freedom from violence, starvation, poverty, and the like are nearly universally-agreed upon. But what do you think of these results? Where would you consider to be the best place in the world to live? One of my favorite and most personally influential philosophers — who I’ve written about before — has just become the subject of an article at HuffPo, where his timeless wisdom is being shared for its relevance two thousand years later. In 167 AD, [Marcus] Aurelius wrote The Meditations, a 12-book compendium of personal writings, originally written in Greek, that reflect his extensive study of Stoic philosophy. Aurelius is now regarded as one of the most famous proponents and philosophers of Stoicism, an ancient Greek and Roman school of thought originating in the Hellenic period concerned with how to cultivate a mindset to deal effectively with any events or emotions. 1. Your own happiness is up to you. It’s easier said than done, yes, but Aurelius’s own life is proof positive of this maxim. The emperor faced great struggles throughout his life, and his reign was marred b ynear-constant warfare and disease. His brother and parents also died at a young age. 2. Life may not give you what you want, but it will give you what you need. 3. There is good in everyone. 4. True peace comes from within. 5. Treat life as an “old and faithful friend”. True understanding is to see the events of life in this way: ‘You are here for my benefit, though rumor paints you otherwise.’ And everything is turned to one’s advantage when he greets a situation like this: You are the very thing I was looking for. Truly whatever arises in life is the right material to bring about your growth and the growth of those around you. This, in a word, is art — and this art called ‘life’ is a practice suitable to both men and gods. Everything contains some special purpose and a hidden blessing; what then could be strange or arduous when all of life is here to greet you like an old and faithful friend? As you can see, these prescriptions remain as applicable and necessary now as they were in Aurelius’ time, which says a lot about the human condition and our inherent struggle to improve it. As many of you may have noticed, there are many similarities between the philosophy of the Stoics and those of Buddhism, Hinduism, Taoism, and other Eastern faiths (for that matter, Christianity, Judaism, and Islam each have schools of thought that overlap with Stoicism, especially with regards to mindfulness). I think that the universal nature of these ideas further underlines their accuracy and importance to everyone; in any case, many of you may find such approaches to be intuitive or even already present in your lives without realizing it. Regardless, they’re vital, and while there’s obviously more to improving ourselves — as individuals and as a species — than just practicing meditation or creating an inner citadel of the soul, it’s a great and valuable step that should nonetheless be studied and implemented. As always, share your own thoughts and opinions. My temperament. This optimism and this discipline. Punctually, at 10 a.m., I am sitting there at the piano, with everything in order around me. For 30 years, I have eaten the same — fish or chicken. Good soup, and this is all. I don’t drink — not tea, not coffee, not alcohol. Hot water. I walk a lot with terrible pains, but after 20 minutes it is much better. Sitting or lying is not good. Even amid the unspeakable misery and despair of a concentration camp, she did everything in her power to keep hope alive. As shown in the Oscar-nominated documentary, The Lady in Number 6: Music Saved My Life, Herz-Sommer, then already a pianist, joined others to perform music in order to lift the spirits of prisoners. Despite all that has befallen her, Alice insists that she has never, ever hated the Nazis, and she never will. Some see in her tolerance and compassion a secular saint who has been blessed with the gift of forgiveness, but Alice is far more pragmatic — she has seen enough in her life to know all too well that hatred eats the soul of the hater, not the hated. I’m at a loss on how someone can be so liberated of hate and despair despite so much tragedy (indeed, her son had died abruptly in 2001, but years later she remained no less positive about life). Even as she approached the end of her 110-year-long life, she remained a passionate and accomplished musician — in fact, she was also the oldest pianist. Here is a brief but touching video of how she was still touching lives even at a 109.